Here is 'Legio' all completed. 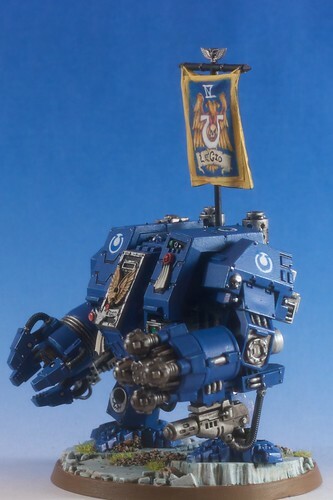 One of the things I am attempting to do with all of my models (in fact, I'll be going back to old models) is adding banners to them. 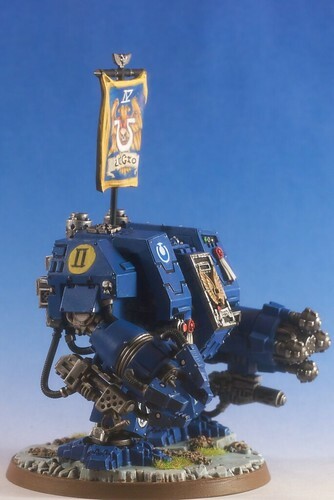 Its one of the coolest things about the 40K fluff IMO that characters run around with big giant banners on their back- saying come get some! So cool. Of course, its not how the current military would do such things, but perhaps things are different 38 thousand years from now. 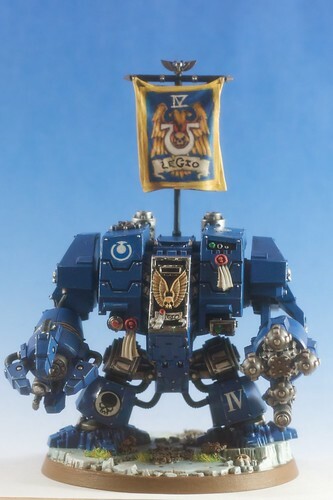 Anyway, since my free hand is so bad- have taken some readily available banners and placed on the the dreadnought banner section, then painted over it- a sorta color in the numbers type of thing. So far, I am happy with the results. Of course one problem with this banner is that it didn't go flush on the banner, but it came close. From a distance, it is hard to tell... only with the macro lens and the magnification does it show up. Anyway, what all do you think of the banners?